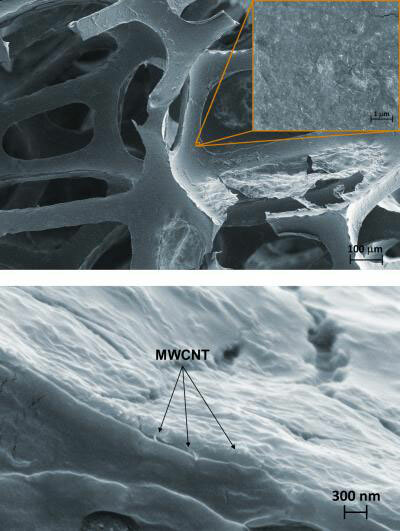 (Nanowerk News) Using an approach akin to assembling a club sandwich at the nanoscale, National Institute of Standards and Technology (NIST) researchers have succeeded in crafting a uniform, multi-walled carbon-nanotube-based coating that greatly reduces the flammability of foam commonly used in upholstered furniture and other soft furnishings. The flammability of the nanotube-coated polyurethane foam was reduced 35 percent compared with untreated foam. As important, the coating prevented melting and pooling of the foam, which generates additional flames that are a major contributor to the spread of fires. The brainchild of NIST materials scientists Yeon Seok Kim and Rick Davis, the fabrication method is described in the January 2014 issue of Thin Solid Films ("Multi-walled carbon nanotube layer-by-layer coatings with a trilayer structure to reduce foam flammability"). Kim and Davis write that the technique can be used with a variety of types of nanoparticles to improve the quality of surface coatings for diverse applications. The pair experimented with a variety of layer-by-layer coating methods before arriving at their triple-decker approach. All had failed to meet their three key objectives: entire coverage of the foam's porous surface, uniform distribution of the nanotubes, and the practicality of the method. Inmost of these trials, the nanotubes—cylinders of carbon atoms resembling rolls of chicken wire—did not adhere strongly to the foam surface. This step proved critical: The doctored nanotubes were uniformly distributed and clung tenaciously to the polymer layers above and below. As a result, the coating fully exploits the nanotubes' rapid heat-dissipating capability. Gram for gram, the resulting coating confers much greater resistance to ignition and burning than achieved with the brominated flame retardants commonly used to treat soft furnishings today. As important, says Davis, a "protective char layer" forms when the nanotube-coated foam is exposed to extreme heat, creating a barrier that prevents the formation of melt pools. "This kind of technology has the potential to reduce the fire threat associated with burning soft furniture in homes by about a third," Davis says.